Spring Weather Means Coconut Cream Pie (take 2)! I realize I’ve done a few pies in the past few posts, and I’m letting you know there are definitely other treats on the agenda coming up. I’m just really loving cold and creamy low carb pies for this warm weather we’re having here in NC! 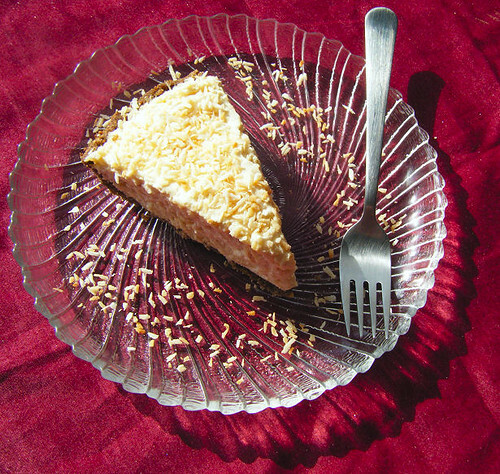 There is another coconut cream pie recipe posted here, which I made back in December. This one is a little different since it is free of any starch thickeners. It’s better tasting and lower in carbohydrates, which is good news for diabetic and primal readers. Now, I realize dairy is in no way primal, but it is a food group that I consume quite frequently since my Northern European ancestors conferred upon me the ability to handle it pretty well! You might try making this pie with coconut cream, but whipping it to a fluffy and light consistency has proven difficult since it is more stiff than regular cream. The multiple steps make this recipe sound complicated, but it’s really just a bit of a drawn out process. I recommend doing little tasks (blog surfing, laundry folding, etc.) during the intervals between the steps. I promise you that the labor will be well worth it. I’m not ashamed to admit this slice was gone within minutes of the photo being taken! This pie is one of my top three favorite desserts of all time. It was gobbled up within a couple of days by my family when I made it as a Christmas treat! It’s got just the right balance of sweetness and richness, with a delicate, light filling and a hint of coconut flavor to tantalize your tastebuds. Bake pie crust according to the directions in this post. Put crust in the freezer or refrigerator to speed the cooling process while you prepare the filling.Dissolve gelatin in 1/3 cup cold almond milk. In a different bowl, separate the eggs. Add 1/2 cup erythritol to the yolks, and whisk it in until its incorporated. Heat the half and half in a saucepan over low heat until you see bubbles at the edges. Add 1/3 of a cup or so of the heated half and half to the yolk/erythritol mixture and whisk quickly. Then, add the yolk mixture back to the pan and cook over low heat until slightly thickened. This process takes about 10 minutes. Be sure to whisk constantly so you don’t get lumps! Remove the thickened mixture from the stove and pour through a strainer into a bowl. Add the gelatin to the heated yolk mixture and whisk it in until it is incorporated. Whisk in stevia and 1 cup of the toasted coconut. Put filling into a bowl, and refrigerate it until it becomes firm. It should thicken up in about a half hour. In a separate bowl, add egg whites plus a tiny pinch of salt and a bit of cream of tarter if desired. With an electric mixer, beat the whites until stiff peaks form. Remove cooled filling from the fridge, and gently fold egg whites into the yolk mixture. It is fine if there are a few streaks of egg white – it’s more important not to break down the light and fluffy consistency. In a separate bowl, whip cream until stiff peaks form. Beat in the vanilla. Fold whipped cream into yolk/egg white mixture. Spoon the filling into the cooled pie crust, smoothing the top over with your spatula. There should be 1/2 cup of filling extra. I like to put it in a separate serving glass for a “preview” tasting of the pie. 😉 Sprinkle the toasted coconut all over the top of the pie. Refrigerate pie for at least 4 hours before serving. 30 Comments on Spring Weather Means Coconut Cream Pie (take 2)! You are welcome, Brandon! I hope you get to try it. Coconut is wonderful, isn't it? Oh my goodness, can't wait to try this! A question — do you use granulated erythritol or powdered? Yay! Thank you for posting a less starchy version. Yummmm. I want to try it. A couple of questions though: In your ingredient list you mention half and half, but it is never mentioned in the instructions. However, the heavy cream is mentioned in two different steps. Is it the half and half that should be heated rather than the heavy cream? Thanks. Elaine – You are very welcome! I do think this one tastes better, too. Carolyn – Thank you for catching that! I fixed the recipe. Let me know how it goes! I'm so glad you've posted and haven't fallen off the face of the earth somewhere. 🙂 I love this blog! I have a black bean chocolate cake sitting in the refrigerator, all for myself at the moment. No one knows about it but me. Please help me! Getting much better at controlling portions these days, even with peanut butter! 🙂 I will definitely be sharing this recipe with friends and family just in case! your blog. I tried out your recipes it came out well. Very delicious. Blogs" Section, so that my blog visitors could also enjoy reading through your blog. Kindly visit my blog. And if you like my blog, please link back. I would be glad if my blog is referred by wonderful blog like yours. Thanks for your time. Hope you too would like my blog. This looks DELICIOUS! Just found your wonderful blog and am a new follower! I have recently gone grain and sugar free 40 days and counting! I am so excited to share some of these recipes with my family for Easter. I'm going to do the mini coconut cupcakes with the buttercream frosting! I hope you keep up the blog for a long time! I LOVE your blog!!! I recently found out I have diabetes and after being depressed for weeks about what I cannot eat. I stumbled upon your blog and got so excited, I have now made a few recipes (YUM) and have all the nut flours and sweeteners etc. on hand!! Your blog helped me out of my pitty party and realize I don't want to eat the crap that is not good for my body, that I can make yummy things that don't hurt me! Thank you so much for all your hard work and sharing! Great blog. I'm glad I found it. Looks amazing, can't wait to try this! I love coconut cream pie. wonder how slices, or tartlets would freeze? I tried this for Easter to celebrate my newly gfsf life. And it was fabulous! I'm a former pastry chef, and I look forward to making more of your desserts and learning along the way (and using it as ammunition to win over my husband! )Congrats–you have a wonderful site! Lauren, this just looks beautiful!!!! Love your recipes. Each one I've tried has worked amazingly well!!! I'd like to make this recipe, but they don't sell half-and-half in my country. Is it just a mixture of half milk and half cream, or is there more to it than that? Lauren, have you thought of compiling your recipes and making them available in a book form, either ebook or on lulu.com? I think what you do is amazing and would love to have a copy of all your recipes on hand. I would certainly buy one, you might be able to make some easy money while you are in school. Can you ditch the half-n-half and just use the heavy cream in it's place to ditch a few more carbs? Just curious.. Most heavy whipping creams in our area are carb-free (but a few aren't) — but half-n-half has a fair amount as I recall..
made this yesterday. totally fabulous!! tastes completely trashy and we devoured it. thanks! I love coconut! Are you familiar with Tropical Traditions Organic Coconut Cream Concentrate? Its heavenly stuff!! 100% pure coconut, nothing more! A little goes a very long way, so worth the price. Hi, Anon! I have heard of that product. What do you like to use their coconut cream concentrate for? Must say I made this for a company picnic and even though I am the only low-carber there are several trying a gluten free diet and everyone just loved it….even thouse not on any diet at all. Thanks so much for the delicious recipes!! I wonder how this would work made without the dairy or the crust. Thanks for your experimenting, Lauren!